Amore Lifestyle Studio corner sofa. This beautiful sofa features two whisper quiet electric recliner actions so that you can realx with the utmost ease. 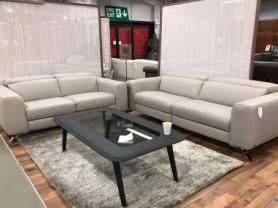 Fully upholstered in beautiful soft grey cloth, this is a sumptuous design without comprimising on comfort. The armless sections and storage section can be moved to suit your room so that you can customise this to your exact specifications. Available with right arm only in grey or blue, the choice is yours. As photographed measures 305 cm x 245 cm x 100 cm deep.